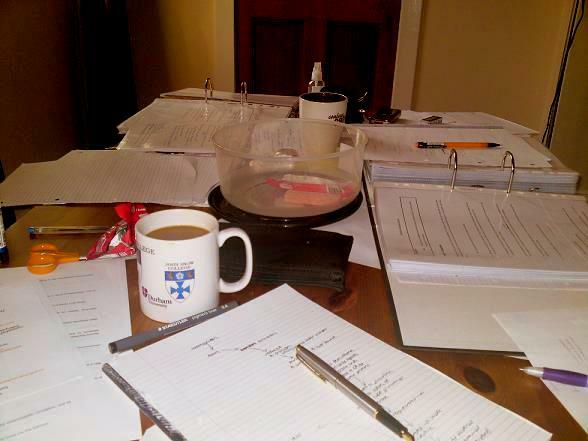 I don’t remember taking this, but it’s a photograph of what our dining table looked like when we were studying for second year exams. I found it on Tuesday night — ironically, when I should have been studying for an exam. Note the full coffee mugs and the empty biscuit tin. Also note the scissors and Pritt Stick, because the things you picked up in primary school are the most fun part of medical school. This was fairly early on in the revision process, going by what I was working on (neonatal jaundice, I think). The second or third day, maybe. The chaos only got worse. It seems that I’ve disappeared into the revision vortex, a bit. I’ve got my first written exam in a couple of hours and then the second one is tomorrow morning, followed by OSCEs on Wednesday and Thursday. So, here I sit, eating my bagel and drinking my coffee and praying for nice questions (and, please God, not too much synoptic stuff). It’ll be over soon, anyway. I’ve reached the point where there’s stuff that I really do need to cover (cholesterol and muscle contraction, for two), and then there is other stuff that I have gone over twice or three times and really should know and probably *do* know but am not actually convinced that I know it, and that is making me freak out. Apart from the girl who does the evening shift in Starbucks and a five minute conversation with my mother every night, I have not actually had contact with people who aren’t medics since last Sunday morning. I am hoping like hell that church tomorrow morning will improve my mood. I had a moment, earlier on. I was sitting in my carrel and it all just got too much and I had to go and sit out in the stairwell and have a cry to myself. In the last two months, I’ve had maybe four days and another five evenings where I haven’t done any work, but, besides that, I have been going flat-out since Easter Monday and I want this to be *over*. There is nothing shameful about doing resits. There is nothing wrong with things not going exactly the way you planned them. Really, take it from someone who did medicine by the scenic route — cocking up my A-levels was one of the best things that ever happened to me. But this year, I don’t know what I’ve got left to give. I don’t know if I can keep going for another nine weeks. I just want to be a third year. Can It Be June, Please? I’m a person who enjoys the simple pleasures in life — clean sheets, good cups of coffee, the smell of a new book, hot showers, a big bowl of rice and daal, the occasional morning off… And at this time of year, I appreciate those things even more. I take an extra five minutes to brew the real coffee. I wait for the moment when my muscles unknot underneath glorious hot running water. I think my bed is the best place in the whole world. I love my Sunday mornings off and I cherish them the way some people cherish diamonds. So, you can imagine that I was deeply unimpressed on Sunday when I was walking towards the subway and, without bothering with little things like asking permission, my brain started to recite the signs and symptoms of pulmonary thromboembolism. “Right ventricular heave and increased JVP,” it replied. It’s almost ridiculous to think that I could have forgotten what it was like, this time last year. I remember the things that I did — all the nights of getting the last subway home, and living on pasta from Little Italy and coffee from Peckhams, and photocopying pages of immunology diagrams at midnight, and standing in the middle of the (empty) atrium and getting two verses into I Am What I Am before I realised exactly what I was doing. All of this, yes, I remember. It’s the relentlessness of it all and the utter physical exhuastion that comes along for the ride, that’s the part I had forgotten. I don’t think I’ve ever worked as hard as this, and definitely not for as long as this. I worked hard for my BSc finals, but it was a lot easier to ‘question spot’ for them and, anyway, a big chunk of my degree class was based on coursework. And twelve thousand words of dissertation on a month-long antibiotic resistance experiment that failed spectacularly is hard work, but it’s a different kind of hard work. In some ways, it feels a little bit good. I’m plugging away and making inroads and there’s knowledge in my head now that I didn’t have three weeks ago, and if I pass this exam, it will be because I have worked my bloody arse off. I crawl into bed at night and crash, and, for seven hours, I sleep the sleep of the people who have totally earned their sleep. But in other ways, I’m just so tired. In my revision timetable, I have a day off scheduled for next week (except for PBL, I still have to get up and go to PBL) and it’s like this enormous shining beacon on the horizon. Did you know that one of the symptoms of total sensory deprivation is a reversion to childlike emotional responses? That’s us. The highlight of our day is getting a tick on the list of PBLs that have yet to be revised. And scrumpling up a piece of paper with a long long pathway that we just learned and scribbled out from memory, and then throwing the piece of paper at the wall? That comes a close second. This incoherent mess of a ramble is brought to you by a day of gallstones and hypersensitivities and stomachs, and, you know, it being two o’clock in the morning. It’s Entirely Possible That I Need A Life. So, I really got stuck into the Block 7 notes last week and it went so well that I was absolutely determined they would be finished by the end of the weekend. Flatmate: How are you doing? Sefkhet: *types last sentence with flourish* I am DONE! Flatmate: Seriously, all of Block 7? Sefkhet: YES. DONE. VICTORY IS MINE. MUFFINS. BAGELS. DONNA! Sefkhet: Right, I’m done for the night. Flatmate: It’s eleven-thirty on a Saturday. Er. I’ll be having tomorrow off, yes? My SSM is off to a slow start and there’s not much I can really do with it yet, so I’ve been spending most of this week making notes on and revising Block 7. At some point, I’m going to do a post on studying with music. I’m a study-with-music person. This morning, I spent a few hours on childhood nutrition with Tomas Luis de Victoria’s The Mystery of the Cross coming through my earphones. It’s a gorgeous piece of music and perfect for me to listen to when I’m working, but it’s a late(ish) sixteenth century setting of the Holy Week lamentations and afterwards I felt that I needed some time with something a little… bouncier. I put on the Mamma Mia soundtrack. I hadn’t realised, but it’s the first time that’s been played since before Christmas, when I sang a lot of it at the Royal Concert Hall. That was absolutely the most fun I’ve ever had on stage.